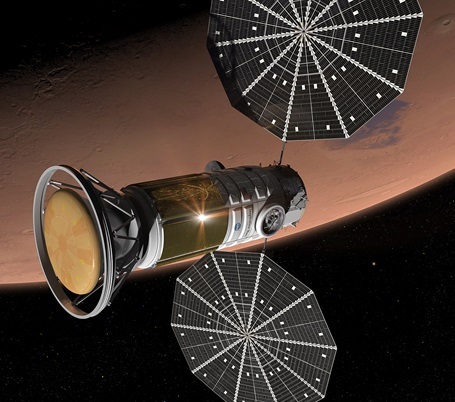 After getting our hopes up last February, Dennis Tito’s Inspiration Mars project has finally released the results of their mission architecture study. Apparently they ran head-on into Grissom’s Law: No bucks, no Buck Rogers. There’s really no other way to interpret this in my unprofessional opinion. Their presentation to Congress last week feels like a “Hail Mary” play that is less about available technology than it is available funding. 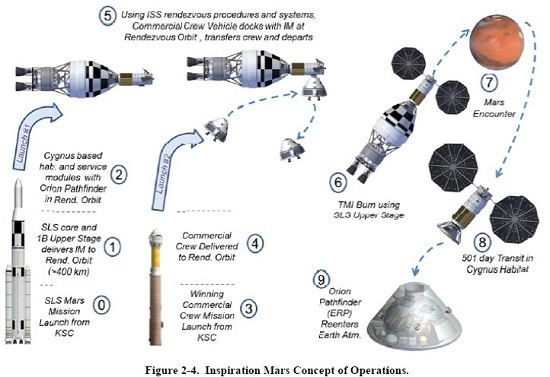 My guess is Inspiration Mars determined that a commercial approach was the most feasible. Given the current state of vehicle development, we’re much more likely to see actual working hardware from SpaceX than we are NASA. Going through their presentation, it’s clear they went to great pains to avoid throwing any hints in the direction of the former. The issue is the sheer amount of gear required for a human mission. The crew will need a module that will keep them alive for the duration of the trip, including all their food, radiation shielding, and a separate pod to protect them during the high-speed re-entry into Earth’s atmosphere. Launching all this along with the crew is impossible with existing spacecraft, the report found. Even if you break the mission into several separate launches, getting all the gear into space would take at least three launches with planned commercial vehicles, such as the privately built SpaceX Falcon Heavy rocket, which has yet to fly. Gotta love that last bit. Falcon Heavy’s development is well under way and the first flight is planned for late 2014-early 2015. Given SpaceX’s record of actually doing what they intend to do, why all the skepticism? Does anyone really think SLS will be as far along before then, or that NASA could bring such a project in for under a billion? Not to mention a stretched Cygnus module, closed-loop life support which doesn’t yet exist, and reentry in an Orion capsule variant that hasn’t even been discussed yet. 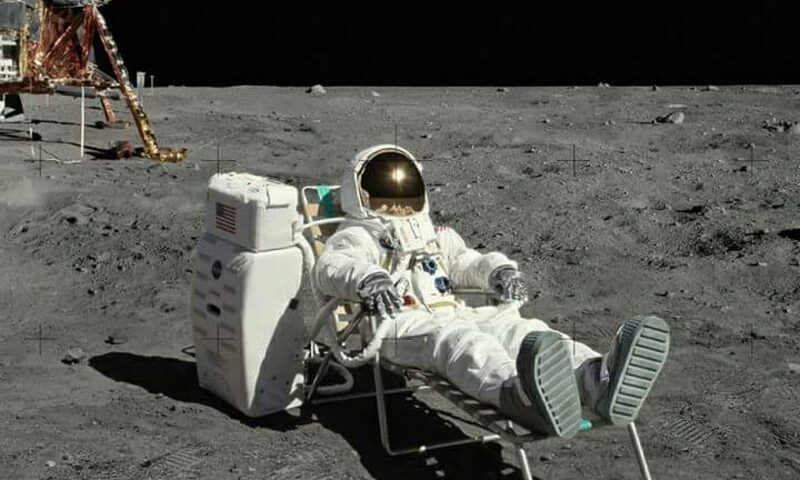 As a wise man recently pointed out, our government used to launch men to the moon. Now they can’t even launch a website. Where’s the unicorn in this picture? Meanwhile, Dragon was designed from the outset to be capable of typical Mars-return reentry velocities. While IM’s 14km/sec entry is beyond even that high bar, it’s a safe bet that Musk & Co. are much more likely to come up with a capable heat shield than the current government arrangement. While an all-commercial approach would’ve been the most likely path to success, that comes with a price – literally. This would have been entirely on IM’s shoulders, meaning real money needed to be spent to guarantee the hardware would be available in time for the 2018 launch window. Apparently the money wasn’t there, and wasn’t going to be there anytime soon. I can see engineers advising Mr. Tito that a couple of Falcon Heavy launches with a Dragon capsule and some kind of Bigelow hab module would be just the ticket. Then the accountants stepped in and made it clear they couldn’t afford that ticket and no amount of frequent-flier miles would make up the difference. So they dropped back to punt (yes I’m mixing up football metaphors but just run with me here), settling on a NASA-centric architecture in the hopes that they could gin up enough support, with the understanding that Congress and NASA are flailing about to find a purpose for SLS. If they’re hellbent on building it anyway, maybe this would give them better cover than just recreating Apollo 8. And a hard deadline certainly wouldn’t hurt. Shrewd and desperate. But mostly desperate. At least it didn’t take long for NASA to see right through this and call BS on the whole deal. Given SpaceX’s goals of reaching Mars, I was always curious as to why they weren’t the obvious partner for such a project even if it meant waiting until the 2021 window. That extra few years could make an enormous difference in capabilities while adding a manned Venus flyby to their intinerary. I’d be happy to throw a billion at that if my last name were Gates or Buffet.